As a purchasing agent, buying the right components, at the right price, to be delivered at just the right time is your ultimate goal. While sourcing specialists are experts at negotiating prices, contracts, delivery timelines, and production planning, you aren’t necessarily knowledgeable about the technical details underlying the commodities and parts you’re buying. This eBook is meant to help bridge that technical gap. The resources provided in this document will help you speak intelligently to your engineering design teams about their wire and cable requirements, and understand what elements of a wire or cable specification could be subject to substitution. Gaining a better understanding of the “what’s” and “how’s” of cable will allow you to consider cost- and/or time-saving alternatives to present to your design team, ultimately helping your company make smart purchasing decisions in wire and cable. Wire refers to a single, usually cylindrical, strand or rod of metal which is used to carry — or conduct — electrical current and communications signals. (What’s the difference between power and signal? Click here to learn.) The term wire can also refer to a bundle of such conductors, as in “multi-stranded wire,” which is more correctly called a cable. Although conductors are usually circular, wire can be made in square, hexagonal, flattened rectangular or other cross-sections, either for decorative purposes, or for technical purposes such as high-efficiency voice coils in loudspeakers. 2. Insulation - Insulation provides physical and electrical separation of conductors and minimizes the free flow of electrical charge from the conductor. It guards against interference and maximizes electrical signal strength, and as such, always consists of non-conductive material to resist the flow of electricity. While insulators can be solid, liquid, or gas, we’ll concentrate on solids. Plastics: Plastic insulators come in a wide range of options from polyvinylchloride (PVC) to polyurethane and polyethylene. These insulators come in a wide variety of thicknesses and rigidities and can be used in many different applications and environments. Fluoropolymers: These insulators are great for high-temperature applications because of its superb electrical properties like high dielectric strength, low dielectric loss and low dielectric constant. Rubber: Rubber insulation like ethylene propylene, silicone and neoprene are popular choices due to their long life, flexibility and ability to withstand high temperatures. 3. Shield – Any current-carrying conductor, including wire and cable, radiates an electromagnetic field. Some wires and cables include shielding to reduce electrical noise and electromagnetic radiation that may interfere with current or signal transmission. 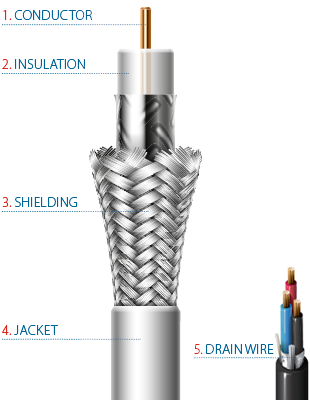 A shield is a layer of aluminum foil or woven mesh braid that surrounds the insulation. Foil provides complete coverage of the conductors while braided shields provide 70-95% coverage, which is sufficient for most applications. 4. Jacket – The jacket protects the internal components of a wire; provides differentiation in its physical appearance; and provides flame, mechanical, thermal, chemical and environmental protection to the conductors and components. The two leading types of jackets are thermoplastic and thermoset. The former is more common, while the latter is generally used in specialty applications. 5. Drain Wire – A wire that is wrapped around or part of a shield within a cable that reduces the resistance from any point on the shield to ground. A drain wire serves to complete an electrical circuit from the shield, thereby carrying extraneous electrical noise to ground and away from the circuit or system the shield is intended to protect. Shield -	A metallic layer placed around a conductor or group of conductors to prevent electrostatic interference between the enclosed wires and external fields. Thermoplastic - A material which softens when heated and becomes firm on cooling. Thermoset - A material which hardens or sets by heat, chemical or radiation cross-linking techniques and which, once set, cannot be resoftened by heating. Drain Wire - In a cable, the uninsulated wire in intimate contact with a shield to provide for easier termination of such a shield to a ground point. Electrical cables may be made more flexible by stranding the wires. In this process, smaller individual wires are twisted or braided together to produce larger conductors that are more flexible than solid wires of similar size. Copper wires in a cable may be bare or they may be plated with a thin layer of another metal, most often tin, but sometimes gold, silver or other material. Tin, gold, and silver are much less prone to oxidation than copper, which may lengthen life of the wire and make soldering easier. Tinning is also used to provide lubrication between strands. Multi-conductor cables can be made in a vast array of configurations including: single twisted pair, multiple pairs, or a combination of pairs, conductors and other components. There are also a wide variety of parallel constructions including ribbon and woven flat cables where individual wires or conductors are placed next to each other. Ribbon cable is useful when many wires are required. This type of cable can easily flex, and it is designed to handle low-level voltages. So what are patch cords? Patch cords, cables, or leads, are electrical or fiber optic cables used to connect one device to another for signal routing. (What’s the difference between current and signals? Click here to learn.) 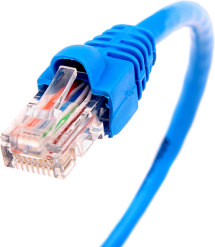 Patch cord cable differs from standard cable in that it is stranded for flexibility, whereas standard cable is solid copper. Because the patch cord is stranded copper construction, signal loss — attenuation — is higher on patch cords than solid cable. Patch cords can be as short as 3 inches (~8 cm) or as long as twenty feet (~6 m) or more. As length increases, the cables are usually thicker or made with more shielding to prevent signal loss and electromagnetic interference. Patch cords are often made of coaxial cables, with the signal carried through a shielded core, and the electrical ground return connection carried through a wire mesh surrounding the core. Each end of the cable has an attached connector to allow it to be plugged in. Connector types may vary widely.